narcoleptic in a cupboard: Fuglies? In my stash?! After an incredibly stressful start to the Stained QAL (come along and join in if you dare...) and having to spend longer than is sensible last night fixing a few errors in my QAL printouts, I thought I'd take a lighter view today. Lucy @ Charm about you is having a party. 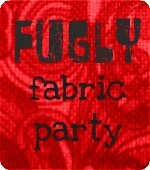 A "Fugly Party". The theory being, we all root out a fugly bit of fabric and blog it. Then as we read each others blogs we can put our hands up and say "no its not, give it to me!" Or at least that is the theory as I understand it. She did also say that it didn't have to be an especially fugly fabric, it could just be something we are not going to use and want rid of. First off we have the Dressmakers Special!!! A FQ of the squares, and more than FQ of the blue swirly. Come on now, lets see those hands up, don't all rush at once!!! Leave a comment below if you'd like one of my fuglies! (please make sure you are not a "no reply" blogger or I wont be able to contact you) If more than one person want something, I'll draw a "winner" this time next week (Feb 12th). *edit* I am happy to post internationally, but if its the dressmakers special it would be EITHER the red stuff OR the lining, both together weighs a ton! This fugly party thing is too much fun! Ooooooh I do like the red shiny paisley print, I can see a cute party dress in that...also love the blue swirly fabric. Btw I am excited for the QAL, thanks for the detailed cutting instructions...I am hoping to choose my fabric tonight...stash busting here we come!! Ohhhh, fuglies! I like the blue swirly one but Fiona got there first so please send it to her, I've had a lovely parcel from you already this month! Hmmm, I'm thinking these might be a step to far down the fugly path for me! LOL I love it! That panel is like from Toy Story 3! And that monkey is a bad guy!! The toy box panel is actually kind of cute. I would like the toy box panel. I agree - the monkey is freakish but I want the airplane and the rocket. Airplane nut here. I'm off to go see if I have any of those fugli's in my stash. . .
That red fabric is truly awful. Not the pattern so much as the shininess! I like the squares and the blue swirly's! THANKS! Oh, I love the toy box panel!!! Please put my name in the drawing for it! SO cute!!!! :-) Thank you for the chance to win an adorable Fugly-- and if I win, I promise to love a care for it until it becomes a beautiful swan! Ooh.....I'm feeling guilty about not doing anything with that last not-at-all-fugly fabric. I DID buy a pretty Christmas one that matches it perfectly - I'll maybe get a new table runner for next year! Get. Finger. Out. Ooh, that monkey - I think there is a Stephen king shirt story about and evil one of those, scary! Third attempt (trying to override auto correct!) a SHORT story about an evil one!! You ladies are SO SO SO funny! And CREATIVE! I think you all should get together and write a comedy. One begin and then hand off to the next for chapter two. My Honey is going to be wondering WHAT I am doing up here with this computer! I liked the panel - but - you scared me about the monkey. I took a liking to the red shiny stuff. I think oriental? Paisley? Is there such a thing as that? It would be nice for the sashings and backing on a Kimono quilt. Now - y'all - don't judge me. Each to their own fugly snuggly! I would love to have the red paisley fabric it is fantastic! I think all your fabric is awesome and I never turn down free fabric. I make quilts for charity and dog beds for the humane society so every piece of fabric I get is used for something. I think the red paisley fabric will look great on me. I figure a blouse using those fabric.I likes the blue swirly FQ too. the FQ adn a bit more than FQ ones the square and twirly owuld be my favourite - but then the paisly-ish panel has something. I would be happy with either. Thanks for giving your fuglies a chance at a new home! I love the stuff and would put it to good use. I also follow you. OMG! You have a print of that cymbal clashing monkey toy! That monkey freaks me out too. I like the blue swirly print. I clicked to follow your blog - and I really do like the "A FQ of the squares, and more than FQ of the blue swirly." fabric.... Thanks for letting me put my name in the hat! I would like the panel or cottons. Thanks for the giveaway! okay. i am totally in love and have to do the stained glass QAL. only one problem....i want it for a queen sized bed. am i nuts or does this mean that i need to do 4 of these? help...as i've fallen into a math coma. Cindi, if you'd like to email me I can help! Please count me in for the dressmaking fabric. I quite like the red fabric for a wiggle dress. 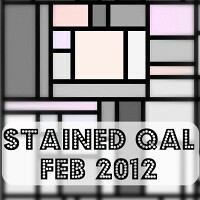 I'm not a quilter myself but I enjoy your posts so much that I've left your blog on my google reader. Another couple of posts and I reckon I could be converted from sewing clothes to sewing quilts.